31 Jan 2019 --- Vegan diets promote beneficial gut hormones that are responsible for regulating blood sugar levels, satiety and weight, according to a study published in Nutrients. The researchers found increased plasma concentrations of the peptide amylin in people who consumed vegan meals. “This study adds to the mounting evidence that plant-based diets can help manage and prevent Type 2 diabetes and obesity,” says study author Hana Kahleova, Director of Clinical Research at the US Physicians Committee for Responsible Medicine. The researchers compared the effects of a non-vegan meal – containing meat and cheese – with a vegan meal on hormone levels in a group of 60 men. The meals rated similarly in terms of calories and macronutrients. Of the men participating, 20 were obese, 20 suffered from Type 2 diabetes and 20 were healthy. When compared to the non-vegan meal, the vegan meal increased postprandial – occurring after a meal – levels of amylin in all three groups. These particular hormones regulate glucose metabolism, insulin secretion and energy homeostasis, satiety and weight management. “These beneficial gut hormones can help keep weight down, enhance insulin secretion, regulate blood sugar and keep us feeling full longer,” says Kahleova. Click to EnlargeEnrollment of the participants and completion of the study. “The fact that simple meal choices can increase the secretion of these healthy hormones has important implications for those with Type 2 diabetes or weight problems,” she adds. The study participants reported that the vegan meal boosted their satiety levels or “feelings of after-meal satisfaction.” Vegan meals are often rich in fiber which adds bulk to the diet, without adding extra calories, the researchers note. “One of the advantages of eating plenty of minimally processed plant foods is that they are rich in fiber, whereas animal products like meat and dairy are fiber-free. Basing dishes on legumes, choosing wholegrain options and adding plenty of vegetables helps to make meals filling whilst keeping the calories down,” Heather Russell, Dietitian at The Vegan Society tells NutritionInsight. In the US, more than 2 in 3 adults are overweight or obese, while more than 114 million adults have either diabetes or prediabetes. 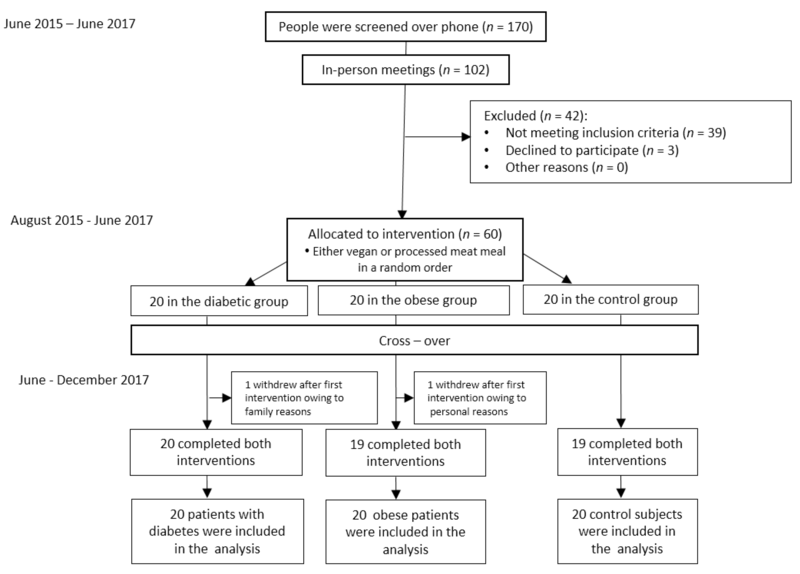 Previous studies have shown that plant-based diets are beneficial for weight loss and that those following a plant-based diet have approximately half the risk of developing diabetes, compared with non-vegetarians. “Going vegan can be an opportunity to improve the quality of your diet by limiting your saturated fat intake and eating more fiber-rich plant foods. Research has linked fully plant-based diets with lower body mass index and rates of Type 2 diabetes, and there is clinical evidence they may help with Type 2 diabetes and weight management,” Russell notes. Moreover, a recent report from the World Health Organization (WHO) found that high-fiber diets reduce the risk of heart disease, diabetes, certain types of cancer and even premature death. Additionally, a comparative study by the American Heart Association (AHA) recently showed that a vegan diet is more effective in reducing the risk of coronary heart disease than the AHA recommended diet. Click to EnlargeInnova Market Insights has tipped “The Plant Kingdom” as 2019’s number two top trend. For the mainstream consumer, going plant-based is about achieving a healthy and sustainable balance between meat and vegetables, rather than adopting an all-or-nothing way of eating. Plant-based growth has been a key theme for several years, but the extent to which it grew into the total mainstream with both vegetarian and vegan options became incredibly clear throughout 2018. 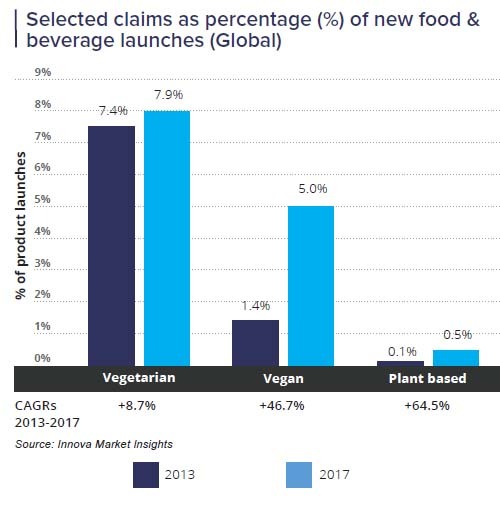 According to data from Innova Market Insights, there has been more than 45 percent average annual growth in food & beverage launches with a vegan positioning (CAGR, 2013-2017). A separate 2018 consumer survey from the market researcher found that one in five US consumers “have eaten less meat across the past year.” The broadening interest in plant-based diets has also resulted in meat alternatives moving beyond their original vegetarian and vegan domain. Their positioning encompasses a much broader base of flexitarians, as NPD focuses on improving quality to replicate real meat. Meat substitutes accounted for 14 percent of global meat launches in the first nine months of 2018, up from six percent in 2013. 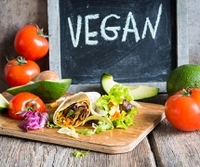 There has been considerable activity and innovation from new plant-based meat brands targeting opportunities for good-tasting, nutritious and sustainable options among vegetarians, vegans, meat reducers and flexitarians.